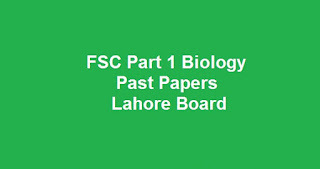 Download FSC Part 1 Biology Past Papers for BISE Lahore Board and All Past Years papers are available right on this page for fsc part 1. As many students are searching for it we have uploaded FSC part 1 past papers. If you are satisfied with this list of FSC part 1 biology past papers list for all past years than share with other students and for further information comment below.